Winning Endurance is a fixed formula so your horse will get the same taste, texture, nutrition, calories and quality 	ingredients from every bag. Cracked Corn, Oats, Cane Molasses, Soybean Meal, Wheat Middlings, Salt, Yeast Culture, Dicalcium Phosphate, Calcium Carbonate, Soybean Oil, Choline Chloride, Lignin Sulfonate, Vitamin E Supplement, Zinc Oxide, Ferrous Sulfate, Copper Sulfate, Vitamin A Supplement, Mineral Oil, Manganous Oxide, Vitamin D-3 Supplement, Niacin Supplement, Sodium Selenite, d-Calcium Pantothenate, d-Biotin, Activated Dried Yeast Product, Calcium Propionate, Vitamin B-12 Supplement, Thiamine Mononitrate, Riboflavin Supplement, Folic Acid, Ethylenediamine Dihydriodide, Cobalt Carbonate. Horses should be fed as individuals to meet their needs of body weight and activity level. 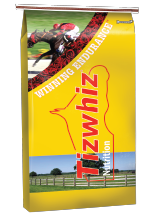 Feed up to 1lb of Tizwhiz Winning Endurance per 100lbs of the horse’s weight per day, adjusting to the quality of hay or pasture available. Body tape your horse and weigh the feed to ensure proper amounts.